Would you like to host our weekly virtual reality web show? Then let us know. 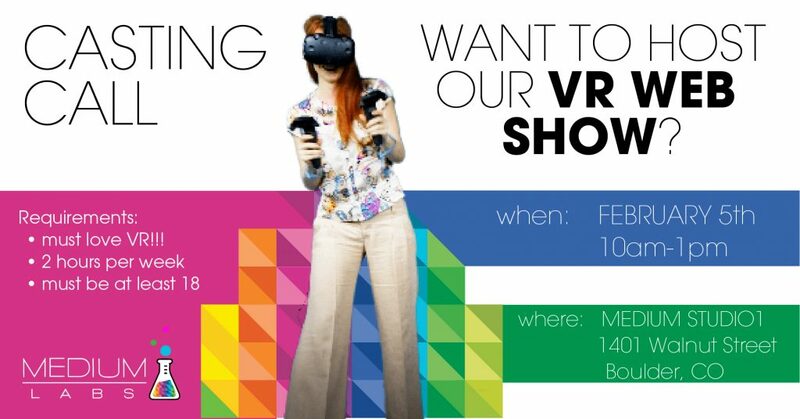 MEDIUM Labs is now casting hosts and hostesses for our weekly VR show in downtown Boulder, Colorado where we review VR games, share VR app experiences, and discuss virtual-augmented-and mixed reality news and technology past, present and future. There are two ways to audition: We are having casting call in our studio MEDIUM Labs in Boulder Monday February 5th, between 10am-1pm, the address is 1401 Walnut Street, Boulder, CO. Come by for a quick on-camera audition. The studio address, time, and date for the casting can be found on the MEDIUM Labs Facebook page. If you can’t make the casting call in person, you can send us your video audition with the hashtag #mediumlabs through our Facebook page, our MEDIUMLabs instagram account, or our MEDIUM Labs youtube account. Online submissions will be closed February 6th at 10pm.